In a male-dominated world, being an outspoken woman with thoughts and opinions you wish to share with others is still seen as offensive. Societal norms remind us that women continue to play a subsidiary role to men. The mantra, "speak only when you are spoken to" holds true to the relentless backlash that women receive when they are perceived as being bossy or arrogant, just for stating an opinion. However, there is a special kind of misogyny that Black women experience online. The kind that has sought out Leslie Jones in an effort to destroy her image and devalue her self-worth. It is no coincidence that Leslie has continued to be the target of online abuse. She is a talented, outspoken and charismatic comedian; whose only fault is daring to exist as a Black woman. Since the incident, many are reiterating the fact that the Internet and online spaces are not safe for women. Time and time again we've seen women being vigorously attacked, sexually harassed and/or bullied into silence online. The inconspicuous landscape of social media creates an ideal breeding ground for racist, misogynistic and sexist individuals to plot and seek out their next prey. Most of these incidents go unaddressed. In an effort to maintain their safety, many women have resorted to temporarily deactivating their account or coming offline entirely. In a male-dominated world, being an outspoken woman with thoughts and opinions you wish to share with others is still seen as offensive. Societal norms remind us that women continue to play a subsidiary role to men. The mantra, "speak only when you are spoken to" holds true to the relentless backlash that women receive when they are perceived as being bossy or arrogant, just for stating an opinion. "For Leslie Jones, her esthetic marks the box she's supposed to belong in." However, there is a special kind of misogyny that Black women experience online. The kind that has sought out Leslie Jones in an effort to destroy her image and devalue her self-worth. The kind that intends to reinforce that Black women should know their respective place; and by stepping out of the pre-constructed boxes society has carved for us comes with severe consequences. For Leslie Jones, her esthetic marks the box she's supposed to belong in. Living as a Black, dark-skinned woman with short hair, broad nose and round facial features juxtaposes the North American standards of beauty and femininity. The rules of her box are quite clear; stay out of sight and out of mind. For, in North American society, women who look like you are not valued. 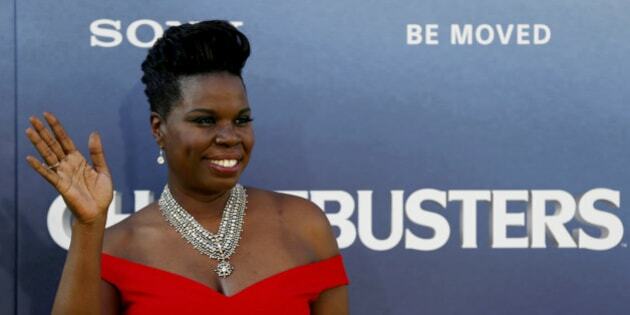 Leslie Jones bravely defies these rules. She boldly posts pictures and videos of herself on social media, accepts roles that propel her into the spotlight and receives public recognition for her work. Her twitter account is filled with hilarious commentary of the latest trends and replies from her fans. Leslie refuses to hide in the box that society insists she stay in. For that, she is punished. Her Twitter mentions flooded with violent racist comments and now her website being forced to shut down by hackers whose primary goal is to shut her up. This form of harassment and abuse is not a new phenomenon. Historically, Black women have always been the prey of harassment and violence in White-dominated societies. It just so happens that the Internet has become the latest tool to evoke such hatred. As a public figure with social influence, her attackers are more likely to be held accountable. As for myself, a Black woman taking up space online; I have come to terms that I have to take matters into my own hands when it comes to protecting myself. Even with Twitter's most recent filter update, navigating social media is still a landmine. I am conscientious of when to or not to hashtag my tweets. I censor, I tone down and screen my followers. This may be a wild assumption, but I feel confident saying that this form of self-policing is not a shared experience among most men. It is a constant reminder that the realities of the real world do extend online. At times, in ways that are even more violent and harmful than we ever imagine them to be. Click here for more stories on ByBlacks.com.